Le Freak – I’m guessing it’s not a disco reference, but then again maybe the brewers have a soft spot for Chic? Anyway, the label is the typical Green Flash style, this time decked out in a reddy/pink backdrop, which is kinda psychedelic. The strange thing about this beer is that it doesn’t actually mention what style of beer is in the bottle. All it says is”Zesty Brew”, which could really be anything. My immediate reaction is something sour, but I’m pretty sure this has been around for a while, and sours have only hit popularity recently, right? But it is from the west coast, and we all know they’re an enterprising bunch. I could check the book to get the answers I need, or I could just stop stuffing around and pour the damn beer! The smell of spicy Belgian-ness comes at me as I pour it, which immediately gives me a clue about what I’m drinking. The bright body is capped by a fluffy white head; Belgian clue number two. The first sip shows off the sweetness you’d expect, then…a long dry bitterness, more akin to an IPA. So there’s obviously a big whack of hops in there as well. Ok, time to check the book to put this mystery to rest. Right, so this beer is a crossover. 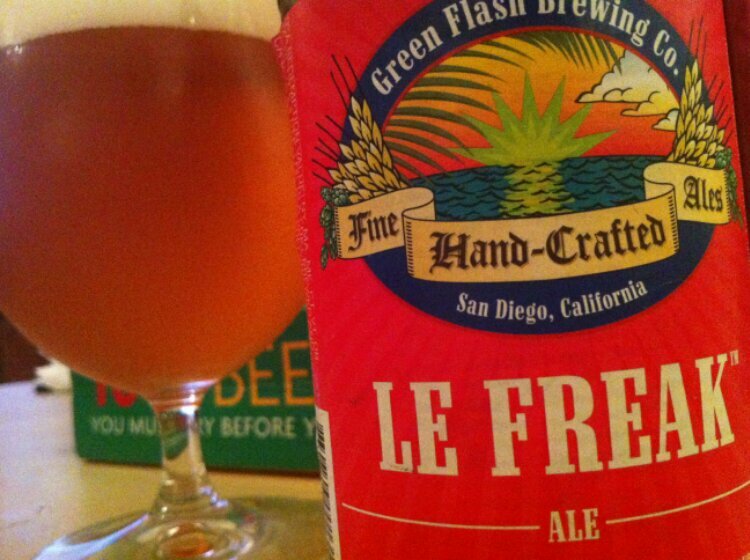 Basically it’s the regular Green Flash Imperial IPA base, packed full of hops, and topped off with a Belgian yeast. Quite a cocktail. And now that I’m aware of what it is, it makes perfect sense. This isn’t a Belgian with some extra hops. It’s IPA through and through; that familiar, palate wrecking bitterness I’ve seen in other Green Flash beers paints the whole mouth. This is balanced by the Belgian candy sweetness that mixes with some citrus,and even a bit of musk stick, all of which manages to contain the 9.2%ABV. I’ve tasted a few ‘Belgian IPA’ hybrids now, but this one is a standout. The Belgian half of this brew does what it’s supposed to do, but it’s the IPA half that really does it for me. It’s got balls. In fact, two say that this beer is half half is unfair. A better ratio is 80% IPA and 60% Belgian, which equals something pretty awesome. Green Flash Brewing Company gets its name from a phenomenon that occurs at sunrise or sunset in coastal areas, where part of the sun can sometimes emit a flash of light, usually green in colour.